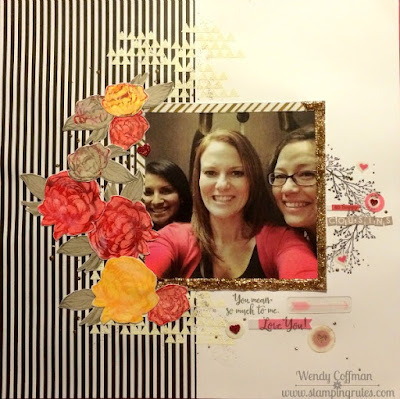 Welcome to the January Stamp of the Month Blog Hop! This month we are featuring Beloved Bouquet, a gorgeous set of 14 images. I never can have too many flower stamps! You may be arriving here from NANCY'S BLOG. The complete hop list can be found here. Let's hop! I was inspired for this project by a stunning layout I saw on Instagram by Jessy Christopher-Tham. She does amazing work, and I thought that the January SOTM would look lovely in place of the die cut flowers she used so beautifully. I used the stripe from La Vie en Rose, embossing with white powder the triangles from Crazy Good. I used Slate ink to stamp the floral spray (in a circle on the right) and the sentiments from the January SOTM. I got my 5x5 prints from Parabo Press, and they are so nice and thick! 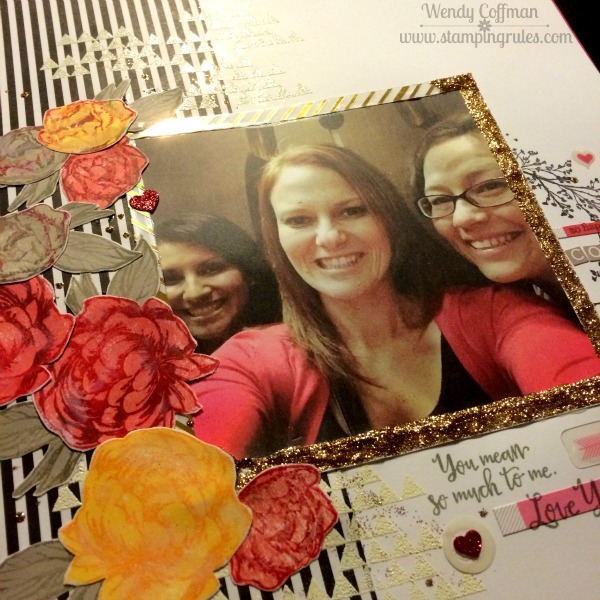 I trimmed the top of a gold PML overlay card into 1/4" strips so I could line two of the sides of my square print. Then I filled in the remaining two sides with so, so much gold glitter gel. Dude, it might still be slightly wet even next week. I patted some glitter gel over the white embossed triangles too, because more glitter is always good in my book. The flowers were stamped onto sanded colored cardstock. I inked only the outline images using the lightest color (like Canary or Whisper) and tapping on bolder colors here and there (Slate and Pomegranate). Then I sanded again and brushed on some Wink of Stella for extra shimmer. Next up on the hop is NINA'S BLOG. Don't forget that this lovely set of blooms is only available in the month of January, so contact your consultant or click here to pick your Beloved Bouquet today! Gorgeous as always!! Detail, details...love it! Beautiful job Wendy!! Love all the little details, Wendy! Stunning Wendy! Your flowers are gorgeous. Love your take on Jessy's page, so gorgeous! 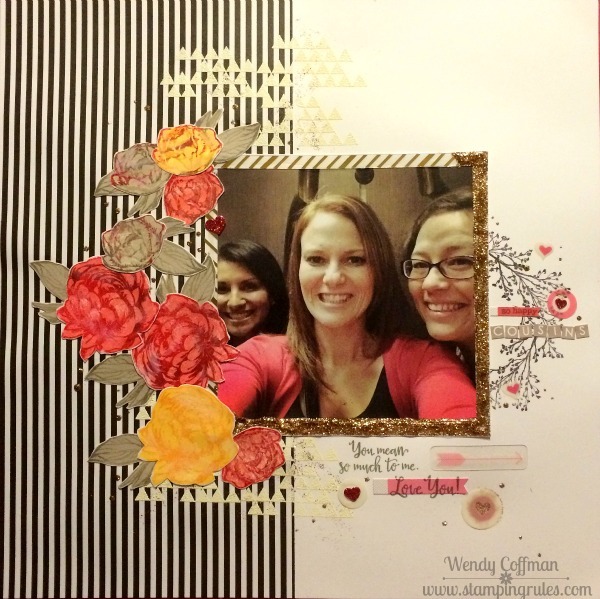 FABULOUS layout, Wendy! Love your picture, too! Gorgeous! I love how you turned the flower spray into a wreath.